February 23, 2014--I have received many helpful responses from the ANG Yahoo Group List in reply to my question about pinning, lacing or gluing needlepoint unto a mounting board for framing. Below is a brief summary of those replies and hope you find it as helpful as I did. Most respondents who have their work pinned to a mounting board have been very pleased with the results and their work continues to lie flat, even after many years. But the pins must be stainless steel to avoid rust. Many do not put glass on top of their work. Instead, they mount their canvases with a layer or two of fleece (not batting) between the canvas and the mounting board. The number of fleece layers depends on whether or not the piece is matted. 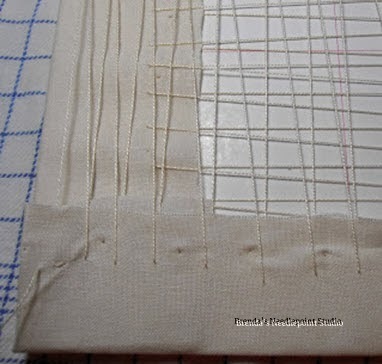 Backing fabric can also be used between the canvas and fleece. Another wrote to say she first laces canvases to a mounting board herself, and then works closely with her framer who must cut additional board to fit around the laced canvas to support any matting used. All in all, everyone agrees it is very important to work with your framer, find out how they do things, and let them know specifically what you want. A few days ago I took three of my needlepoint canvases to a new framer who uses pins—no glue. Hopefully the canvases will remain tight for many years to come. But I will take one of the framed pieces and remove the paper dust backing to see what was done. It’ll be worth paying for a new dust backing just to confirm they are doing what I want. I also chose museum type glass to protect my work from dust, dirt, sunlight and fingers. There’s lots of new home construction going on around me and every time my door is opened, fine particles of dirt blow in and sit on everything. I have a small appreciation of what it must have been like to live in the Dust Bowl during the 1930’s. February 19, 2014--I moved to a new state 3 years ago and the local framer of needlepoint uses glue to mount my projects. My work is now buckling and/or warping in the frame. The framer tells me it's because of extreme temperature and humitity levels in my home. I'm not happy with this response. But I must give him credit--he is remounting my projects at no additional cost. This may involve new matts, so could be expensive for him. I'm now looking for framers that will lace my needlepoint, but they are hard to find or too far away. I did find a framer about an hour away from my home who uses stainless steel pins to mount canvases. I've aked the fine members of ANG's Yahoo Group List if anyone has experience with pinning and/or if they've had good luck with the glue down method? Also, if I use the pinning method, what should I be aware of? Will my pieces still warp and buckle with pinning? Stay tuned. I'll post what I learn.